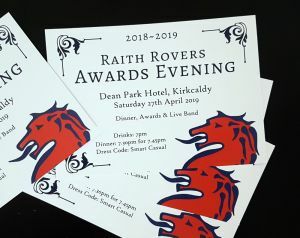 Plans are now well underway for this season’s Raith Rovers Awards Evening, with this year’s event being held at the Dean Park Hotel in Kirkcaldy on Saturday April 27th. The annual event both recognises individual performance on the pitch over the season, as well as a chance to reflect on the contributions of everyone involved with the club this past year. BBC Football correspondent, Brian McLauchlin will be our host for the evening, with local band State of Emergency playing at the post-awards party. The Rovers squad, management team, directors and office team will all be in attendance along with over 100 Rovers supporters from all the different supporters groups. With the supporters groups ticket allocations being close to a sell-out, we are delighted to let you know that a very limited number of tickets will be available in a public sale. Tickets cost £30 each and will be available from the club ticket office from Saturday 13th April (before the Stranraer game) and then available during office hours until these are sold out. These will be available on a first-come first-served basis. The ticket price includes a welcome drink, 2 course meal, and a night of entertainment – the revealing of all of this season’s awards, the chance to vote on the night for the Goal of the Season award, as well as an auction and raffle with some great unique items up for grabs. As ever, all of the proceeds for the evening will be donated back to the football club. If previous events are anything to go by, then this is expected to be another great evening’s entertainment.